Finding a good laptop bag is like finding the perfect pair of jeans. You just don’t feel comfortable with something that doesn’t do everything you want. I’ve had more than a few laptop bags over the years and finding that fine line between being too small and too bulky is practically an art form. For me, that line was discovered with the STM Alley Laptop Shoulder Bag. 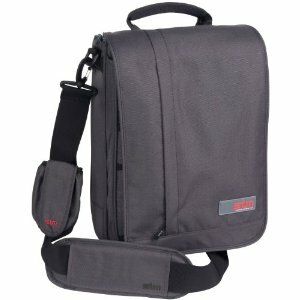 The smaller version of this bag is a perfect fit for the 13-inch MacBook Pro and a padded slip pocket is designed to accommodate a tablet computer such as an iPad with ease. Everything I need to take with me, including the cables, fit right in the STM Alley. The bag is made out of a rip-stop canvas material that protects it from tearing should it be snagged against a sharp object. Pockets intended to hold electronics are lined and padded with a high-density foam that looks as though it could protect against trauma from a low fall. I still wouldn’t trust this bag to protect against the conveyor belt of an airport x-ray machine, though. The vertical appearance of the bag is a welcome sight. I have a problem with horizontal bags as they tend to catch on things as you pass by in a tight space. In addition, my wife says it’s the only bag I have that doesn’t look like a purse. This is a good thing, and perhaps on of the biggest reasons I carry the thing around with me as opposed to the dozen other laptop bags in my closet. The shoulder pad is very comfortable, and possibly one of the better ones I’ve used. Upon opening the front cover (which itself is a giant pocket), you have access to a small pocket that’s made for carrying small external hard drives or other flat devices such as a USB hub or a coiled cable. Another, zipped, pocket extends the width of the bag and has plenty of room for a standard laptop power cable. The larger flap pocket can also accommodate this cable, though I’ve found it more useful for bulky items like a mouse or a snack. Along the top of the back is a handle you can carry the bag with if you prefer to go without the removable shoulder strap. A back pocket is made for documents and is about the right size to fit a small stack of standard copy paper. I’ve found this pocket to be quite useful when carrying documents around town in cases where avoiding creases and wrinkles is a must. The pocket itself remains very flat and the presence of a laptop actually turns it into a very reliable candidate for this job. Though I don’t have much use for it, there is a mobile pouch that attaches to the shoulder strap that can hold your mobile phone, ipod, or other small device. It could be very useful if you’re wearing your laptop bag and want quick and easy access to your phone, or if you’re listening to an mp3 player and don’t want to keep it in your pocket. Over all, this is a great laptop bag, and perhaps one of the better-made ones I’ve had the pleasure of testing out. It’s survived a couple business trips and plenty of Saturday outings without issue. For the money, I’d say it should definitely be on anyone’s short list.